eMachineShop makes it easy to design and order custom parts with vibratory finishing. 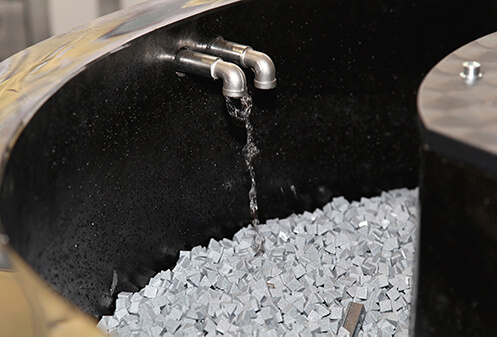 Vibratory finishing changes the surface of parts by placing the parts in a vibrating bowl of abrasive media. The metal finish process produces a uniform random texture and slightly rounded edges. The process is used to remove burrs and improve the appearance of relatively small parts. Vibratory finishing is an inexpensive method. Vibratory finishing can be applied to Custom Enclosures, Custom Metal Brackets, Custom Robot Parts, Custom jewelry, Custom wrenches, Custom Motorcycle Parts, Custom Auto Parts, Custom Toy Parts, etc. The process is often applied to: Aluminum, Stainless Steel, Copper, Steel, Brass, Titanium and Bronze.